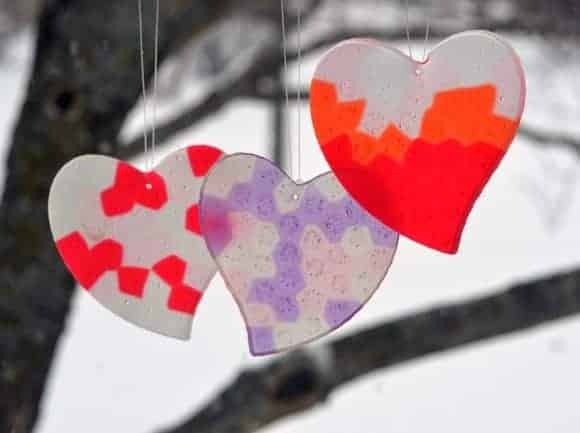 Valentine’s Day is sneaking up fast, so I thought I would share a couple quick and easy decoration ideas that are great for kids and adults! 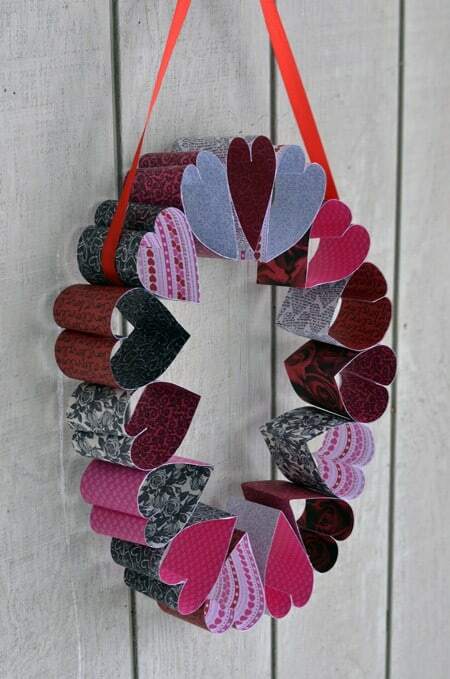 Store bought decorations can get pretty boring and honestly a little (a lot) cheesy… so why not make your own? 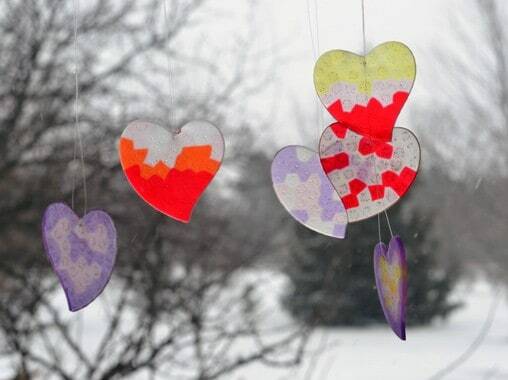 The two crafts I’m going to share with you got their inspiration from The Artful Parent with their Melted Bead Sun Catchers and The Hybrid Chick with her paper heart wreath. When I read the post from The Artful Parent about making these sun catchers I know she warned about the plastic fumes and smell, and I don’t think it registered with me. I, of course, put them in the oven with all of the windows closed, no fans on, etc. WARNING: don’t do that! Before you start, get some fans going, open windows (even if it’s really cold) and maybe have the little ones go play in the snow. The good thing is that they melt really fast and the smell goes away quickly. On The Artful Parent blog, I saw someone recommend using the grill or taking an old toaster oven outside, both good ideas! 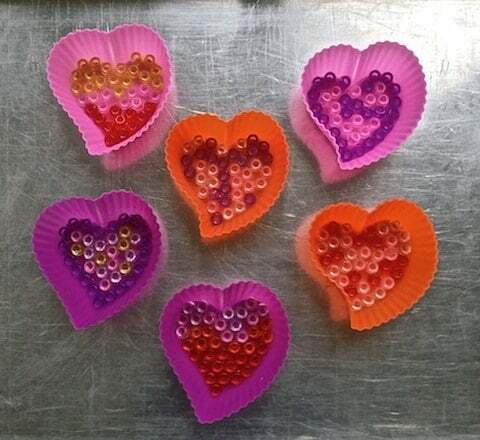 Heart Shaped Cupcake Pan or Silicone Cupcake Molds (I would use one you won’t be using for baking again even though there was no visible residue). I got the silicone hearts for three dollars at Hobby Lobby. Place pony beads in whatever design you would like…making sure they are all facing with the hole up. Tie fishing line and hang where they can sparkle in sun! I love the way these turned out and I will definitely be making more! I wasn’t able to get the wreath to hang in a perfect circle but, that’s okay with me. 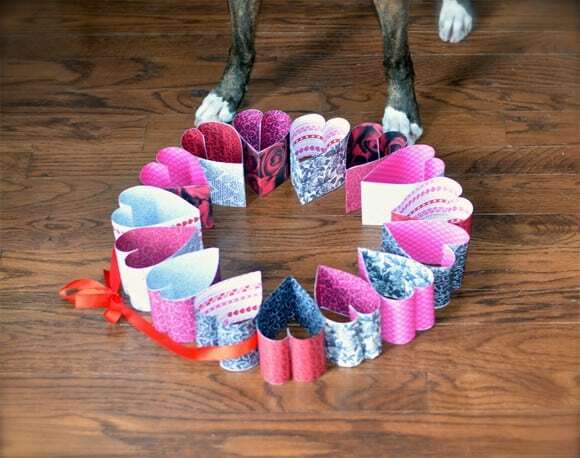 I would suggest using thicker paper and making it a tiny bit smaller if you want it to be perfectly round. Or, if you come up with a way to hang other than ribbon that would work better, let me know. 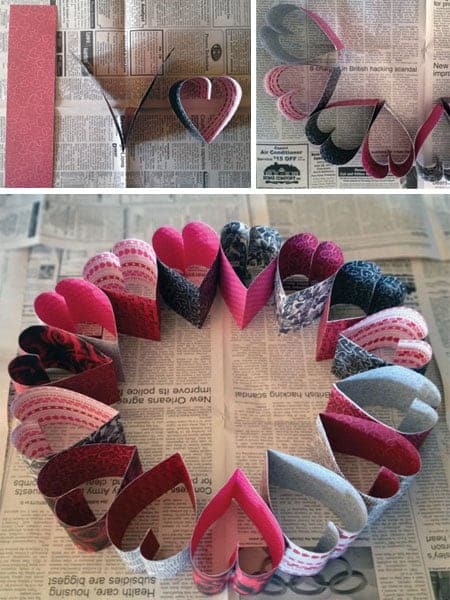 We hope you enjoy these craft ideas as much as we do. If you decide to create either of these crafts, or any of the craft projects that we share with you, please feel free to share your finished product with us on our Facebook page! Very creative. I also didn’t realize that normal beads could be melted down like that. Now there are tons of ideas to try using this method. Thank you for sharing!!! Lindsay, the wreath is such a cute idea. I will be making this with the kids tomorrow. Love the look of the sun catchers. Thanks, Lisa! Let us know how it turns out!